Mood board: Last season, womenswear design director Fran Stringer took her second season off from a full runway show, instead devising a presentation that showed off Pringle of Scotland’s archive designs, and publishing ‘Pringle Bulletin’ a new version of the brand’s employee magazine, which ran from 1949 until the 1970s. Her version featured an expansive visual narrative of the brand’s history, from its Hawick hometown to portraits of those that encompass the label today. Fundamentals were also a focal point for her A/W 2019 runway show, which explored the core principle of Pringle of Scotland – its expert skill in knitwear. This meant an exploration of fabric, from chunky waffle knit to superfine merino. Neutral pieces, like monochromatic tracksuits and capes were accented with sporty chevron stripe sweaters and patchwork tartan jumpers, which nodded to both the brand’s golfing heritage, but had a touch of grunge too. Best in show: The soft tracksuits that opened the show, in beige, grey and white were utterly luxurious, and oozed relaxed elegance. 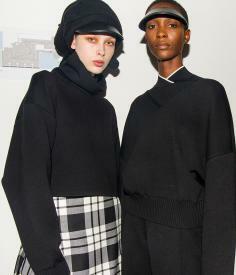 The Pringle of Scotland woman who is preoccupied with fabrication will be first in line.